Until the mid 1990’s, Bradford Woods’ north end property was leased by the Boy Scouts, who called it Camp Bradford. 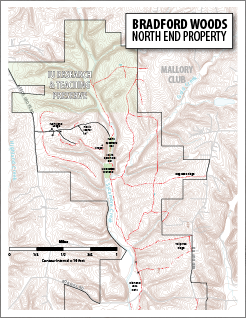 Today, the north end offers a great primitive camping experience, along with thousands of acres to explore and more than six miles of hiking trails. 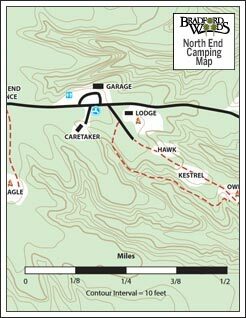 Visitors can camp up on top of the hill in the old Boy Scout patrol areas, can go down the hill and camp in the “flats,” or can set off backpacking and camp somewhere in the wooded acres. Water is available at the entrance gate to the north end. Note: the physical address of the North End entrance is 7861 Beech Grove Rd, Martinsville, IN 46151. $3.25 per person per night. Minimum group size of 10 people.